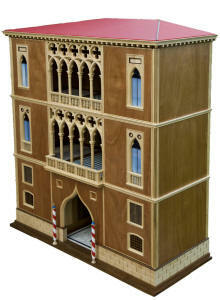 The Venice Palace is the latest and most spectacular cabinet designed and made by Furniture Follies. 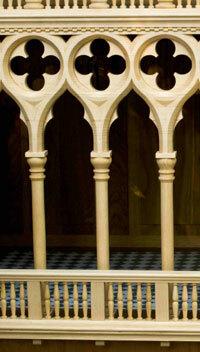 The design is based on the magnificent 14th and 15th century Gothic Palaces that face onto the Grand Canal in Venice and features elaborate and intricately made tracery panels that are typical of this period. good taste in luxurious surroundings, so here we have an abundance of fine detailing, authentic mouldings, natural stone floors and oak panelling. Our Palace captures perfectly the grandeur and magnificence of these wonderful buildings and is conceived as a display cabinet so you too can show off your fine collections in a unique and beautiful setting. 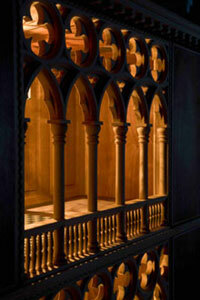 2 doors open on each of the upper floors and the open tracery panels can be glazed from behind if required for security. Below, 2 spacious drawers provide extra storage. Each floor has specially made lanterns that illuminate the interior and this gives the Palace an enchanting new dimension at night. The cabinet measures 1m70 high x 1m40 wide x 60cm deep, does not dismantle and is very heavy! We have used Lime for all the carved and detail work, as well as walnut framing and oak panelling, housed within a veneered ply carcase. Finally, there are several smaller panels on the facade that await the new owner to add his or her finishing touches, perhaps names or dates or other inscriptions, possibly special motifs or family crests. Whatever is chosen we will be able to make up for you and so what is already quite unique will also be highly personal.